A spokesperson said there had been “informal contact” to remind the hospital of the commissioner’s codes of practice. The National Maternity Hospital at Holles Street. 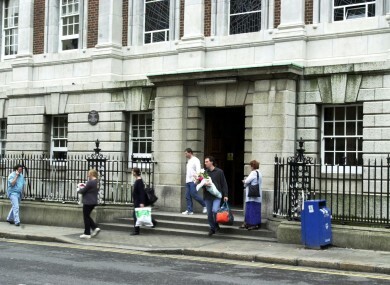 THE DATA PROTECTION Commissioner has contacted the National Maternity Hospital at Holles Street over a potential data breach after a story in the Irish Times last week revealed details of a woman’s abortion at the hospital. A spokesperson for the commissioner told TheJournal.ie that there had been “very informal contact” with the hospital over the phone in relation to the matter. Last week, the Times reported that doctors at the hospital had carried out the country’s first termination under the provisions of the Protection of Life During Pregnancy Act 2013 – a claim that the Department of Health has refuted. The hospital has since launched an internal investigation to discover the source of the leaked information. Last week obstetrician at the hospital Dr Peter Boylan said that it is “absolutely unacceptable for patient details to be splashed around the front pages of the newspaper”. “Patient confidentiality is absolutely critical in our dealing with women in sensitive and difficult situations,” he said. Email “Data Protection Commissioner contacts maternity hospital over abortion data leak”. Feedback on “Data Protection Commissioner contacts maternity hospital over abortion data leak”.